New Balance comes in full force, with 4 models to choose from the concepts, and designs are meant to drop your mouth wide open. Let first look at the New Balance 574 "Pennant Pack" which is inspired by the American past time "BASEBALL" it is made with a vintage retro look, consistent of a Jersey mesh upper, a soft suede leather, and a pennant logo inside the tongue of both the Left & Right shoe. But most importantly we recognize what the USA culture is about. Another installment of the New Balance 574 is the "Camper Pack" , for those people hiking or camping, these sneakers are just the right fit. hitting you with a branded Country Side Logo on the tongue and a nice Flannel-Like print lining to stay on theme. The uppers is made from ripstop material, most of the time seen on Tents for the sole purpose of strength, and water resistance, These Smooth Grey / Burgundy are a nice sneaker to add to the Hikers Collection. 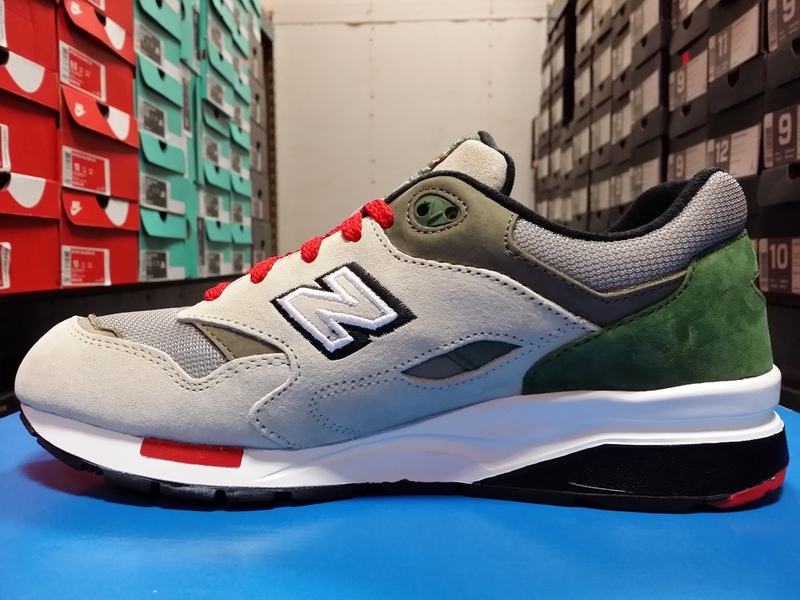 Our next sneaker is a MADE IN USA New Balance strictly focusing on this shoes to be constructed to the highest standards, making it an ideal product from interior to exterior designs. This NB 1400 features a black mesh and suede upper is contrasted against an off-white midsole, white laces, and the classic bold New Balance “N" in Red. In addition it features a nice Image of the Windy city CHICAGO, which matches the inspiration color way known as the "BRED" a Chicago Bulls color combining the Black, Red, and White. Inspired by the NBA team Jersey, Click on the images for a closer look at this Master Piece. The Final sneaker we are looking into comes from New Balance Elite Edition department, which directs it's attention to a more classic or classy edition of the NewBalance Sneaker Collection thought the years. The New balance 1600 has been creative in different color ways, but one strikes the most beloved of all-time. The Khaki, Red and Green, build from a premium suede upper body, it also features a mesh on the Toe Box and Back Heel, in addition I comes with ABZORB comfort technology. A perfect shoe to farewell the summer and bring Winter & Fall with an Olive Green and Joyful Red. Check out the images and give us your thoughts. Air Jordan Future "Black Ice"